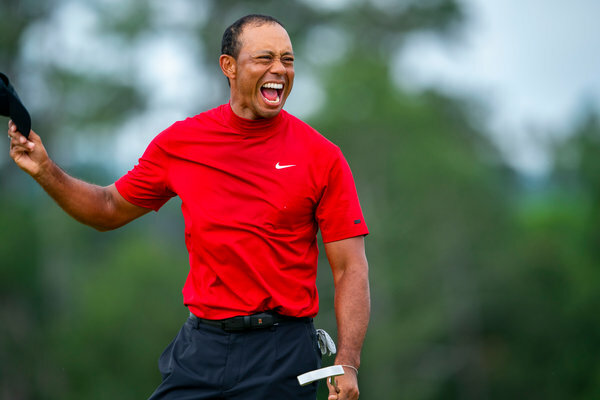 AUGUSTA, Ga. — If Tiger Woods’s victory at the 2019 Masters is among the greatest comebacks in sports history — and it is at least a leading candidate — its origin will forever be traced to what happened on the 12th hole on Sunday when the old Tiger Woods suddenly reappeared at a major championship for the first time in 11 years. It was far more than a golf hole. It was psychological drama, the instant a former champion reclaimed his domain, and the kind of seminal moment that helps rewrite a sport’s history. Among the many things that Woods lost in his public fall from grace a decade ago, one of the most obvious was his steely resolve. Gone was the inimitable fortitude that had allowed him to rise above — and then put away — opponents in the crucible of high-pressure competitions. It was whittled over time, but it had unquestionably been missing. In the 14 minutes that began at 12:30 p.m. Sunday at Augusta National Golf Club, the famous Woods intimidation factor was rejuvenated. About 90 minutes later, when Woods was trying on a fifth green Masters jacket and celebrating a 15th major golf championship, it had been fully restored. And everyone in the field knew it. “Tiger’s back,” said Brooks Koepka, the two-time defending United States Open champion. The opening episode of the day’s turning-point chapter was when Koepka and Ian Poulter, who were playing in the group ahead of Woods, each fell victim to the mental and physical pressure exacted by the mystifying 12th hole. Each dunked his tee shot in Rae’s Creek, which separates the green from the tee 158 yards away. Koepka and Poulter, who had been challenging for the lead, each double bogeyed and never recovered completely. Then Francesco Molinari, who had a two-stroke lead over Woods and was playing in his group, misjudged and mis-hit his tee shot at the 12th hole into the water. So did Tony Finau, also playing with Woods, and only one stroke behind him at the time. Woods, playing the hole for the 86th time at the Masters, knew to aim more to the left and used enough club to fight through the tricky breeze to position his ball safely in the center of the green. But what happened next is what truly altered the mood and kick-started Woods’s charge to victory. Woods walked over the Hogan bridge and stood defiantly on the 12th green glaring back at Finau and Molinari as they dejectedly stood on the other side of the water, rummaging through their bags for another ball and club to once again try to traverse the creek. Molinari and Finau eventually put their third shots on the green. Woods subsequently putted out for his par. Looking thunderstruck, Molinari and Finau missed bogey putts that led to matching double bogeys. With the tournament on the line, four players at the top of the leaderboard had each dropped two strokes. It was 12:44 p.m. and Woods, for the first time in the tournament — and the first time since 2005 — was tied for the lead in the Masters. And what of the death stare from the 12th green as he waited for his chief rivals to sort out their troubles at the very center of the classically crucial Amen Corner? Woods let his actions speak for themselves. “It’s a tough hole,” is all he said. It is especially tough if Tiger Woods, once again commanding and authoritative, is shooting you daggers. Woods’s victory rekindles a debate that had been dormant for years: whether Jack Nicklaus’s record of 18 major championships can yet be surpassed. Woods wouldn’t opine on that topic, either. Woods was hoarse from the primal-like screams he unleashed after tapping in the final putt on the 18th hole to secure his one-stroke victory. At that moment, he had celebrated uproariously around the green, with an unbridled elation and childlike spontaneity that he rarely displayed when he was 20 years younger. Afterward, an ever-smiling Woods, 43, was even willing to assess his legacy, something he has always been loath to do. “I’ve driven a lot more youth to the game,” he said. “You know, a lot of the guys that are on the tour now, they’re training. They are getting bigger, stronger, faster and more athletic. But Woods had not bequeathed his dogged determination or his ability to impart his will on the outcome of golf tournaments. It had been missing from the game. At the 12th hole on Sunday, it resurfaced and changed the face of the 2019 Masters. Now the sports world will wait to see if it eventually rewrites golf history.